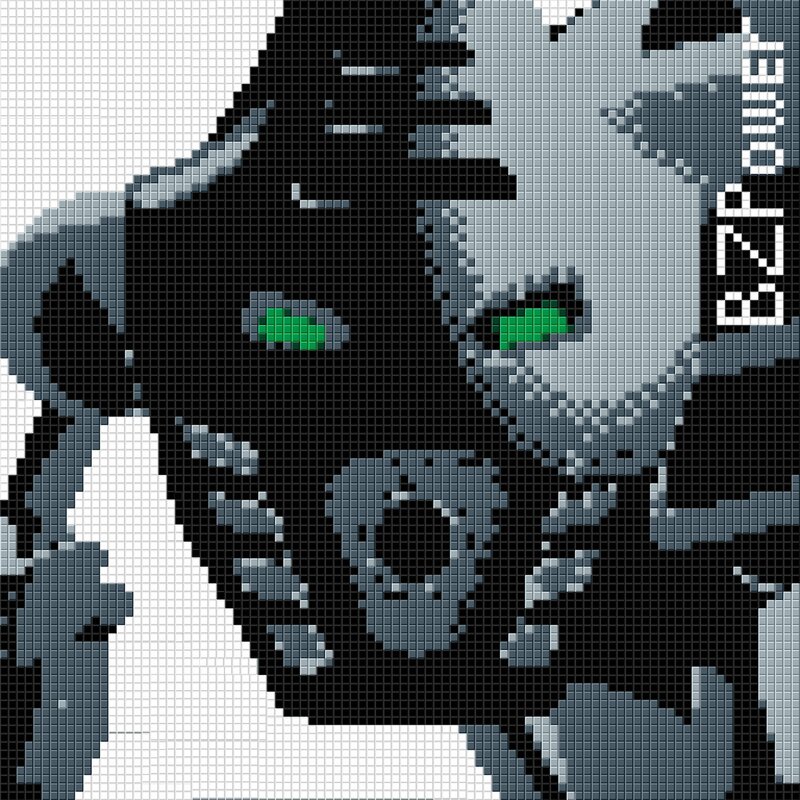 Make Bionicle / CCBS / System builds of the Galidor characters. The trip was too short for me, but t'was all the time I could afford this year. 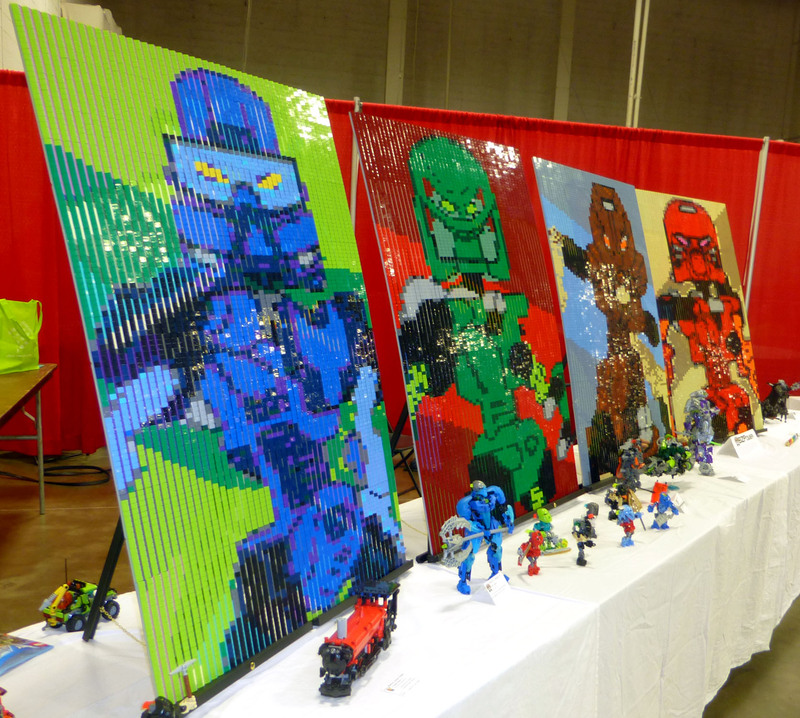 Maybe in the future I can return to BrickCon for the full event to contribute to the cool displays, hang out with the fun people, and also chill in Seattle. For now, I guess I will just focus on helping make Portland's BricksCascade into just as cool of a convention. So I spent 8+ hours yesterday trying to sort my loose Lego pieces post-convention, and I decided to play the new Moana movie in the background. And then thus I was inspired to write this post. And after watching all the extra commentaries they had on the movie, I am even more impressed by the amount of work and detail that went into it. I've heard a lot of complains that this was just Disney appropriating another culture, and there are a couple of glaring instances of that. But when watching the commentary, I'm realizing that the Polynesian cultures had a big role in making this movie, so it really feels like they not only gave permission but actively helped shape it. And I guess a few groups are still upset about some aspects. But that's probably because "Polynesians" are so diverse, so what was cool with one area might not have been with another. I thought the movie had a distinct Hawaiian feel to it, but they were taking more cues from Fiji, Samoa, Tahiti, and New Zealand, and those are related but distinct cultures. (That's why there's no Pele, who is predominantly Hawaiian, I believe. Maui, however, is a demigod recognized in all these cultures, although with differing stories and origins.) Anyway, I suppose it's easy to be impressed by the making of a movie I already liked, but I still think it's awesome at how much of this culture they integrated in. (And I mean, it turns out there really was a thousand year period where the Polynesians of Samoa weren't voyaging, and then they just started again, and nobody knows why. So they give their fantasy explanation in this movie. I did not realize there was actually any historical significance to that.) And all the voice actors they used were actually of Polynesian descent... well except Alan Tudyk. 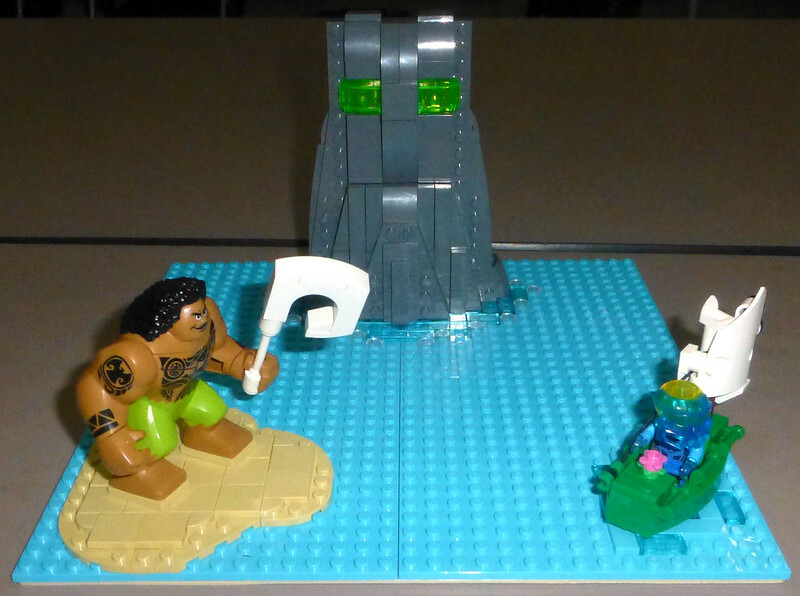 These are the two Polynesian inspired stories that I'm fans of, so it was obvious I was going to have to combine them together in a MOC. 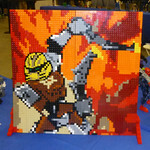 (Although Lego is totally guilty of appropriating the culture for Bionicle, so that's an example of how not to do it.) And since Moana's home island is called Motunui, which sounds soooo close to Mata-Nui every time I hear it, how could I not make this model? I did want to make a bigger Great Spirit Robot, like with perhaps it's upper torso and arms... but I ran out of time / pieces, so this is it for now. 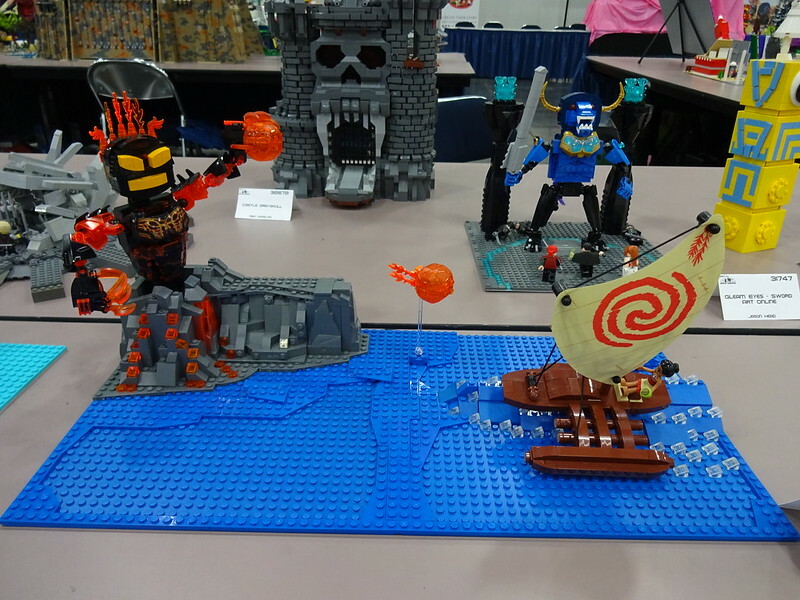 I shipped the head and the Gali minifig boat to BrickFair, so hopefully they'll show up randomly on the Bionicle table? Anyway, that's it for my gushing about the movie and the sets I made from it. All said, I STILL have a lot of sorting left to do, so I'm going to have to put in a different movie now. I guess I do have a lot of extra medium lavender, in case someone needs help with that color. Can't wait to see it come together at BrickFair. We'll go with our usual standards: Use bricks or 3 stacked plates, solid studs up (no brick studs with holes). We'll use the newer shades of grays and brown. This is intended primarily for BrickFair Virginia; if enough members want to keep it on the convention circuit, we can decide that at a later date. Anyway... yeah, here it is. Now to see if we can make this one a reality too. How can I make this happen?? Also kinda surprised I didn't blog at all in April or May. I mean, I've been a'lurkin' but just haven't posted stuff I guess. Been busy with life and work mostly work. And, since I guess I haven't mentioned it here yet, I do have a flight and registration paid for BrickFair Virginia this summer. Not a 100% guarantee that I'll make it, but I'd be wasting a lot of money if I cancel now. A couple of different variations that could be done for good ol' Umarak. 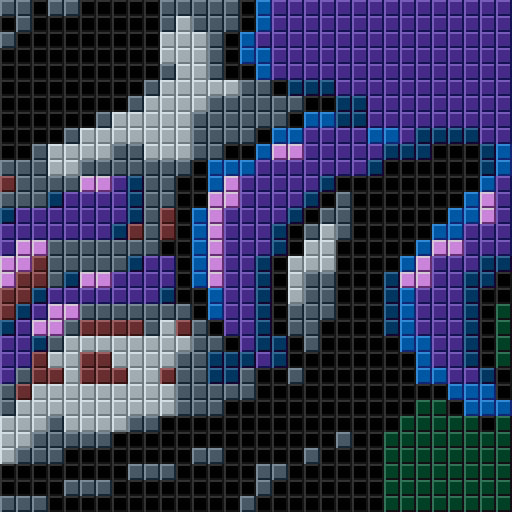 He's looking to be one of the more popular sets in the winter wave, so why not glorify his might in a mosaic, eh? Plus, y'know, mask of control. 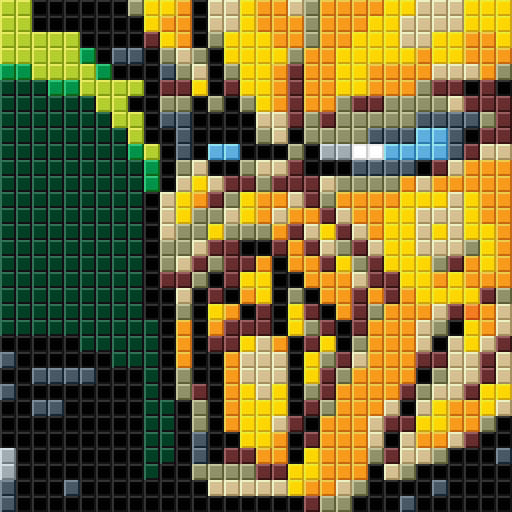 I did try throwing Onua's uniter mode from the comic through the mosaic generator. It turned out... basically a blob of purple. Some of the other Toa might turn out better, but unless there are higher resolution versions of the comics, I'm less optimistic about those working out. Thoughts, lack thereof? BOW BEFORE ME, SHEEPLE!! Oh, not quite there yet? Well it was worth a try. So last weekend I attended Brick Universe in Dallas, Texas. This is actually the first non-local convention I've been to since BrickFair 2011, so it was fun to see how many MOCs I could cram into a suitcase. I got a fair amount there; I think my stuff took up about 3 tables. (Stuff was grouped together by builders rather than themes, but most of my stuff was Bionicle anyway so no big deal.) I do think I was the one who traveled the furthest to get there; Oregon is just a bit further away than Virginia or Florida. I got to hang out with a lot of great folks, like Toaraga, danny316p, Emzee (Furiosa's Sidekick), InnerRayg, Zox Tomana, and some more who's names I'm forgetting. And then of course there was Matt from Beyond the Brick and this fellow Andrew from Bee-Zed-Power, who were always busy giving talks to the public or leading discussions and stuff. (And on the side, I got to hang out with one of my other friends who lives in the Dallas area after the convention.) Lots of great time spent. The MOCs were quite amazing for a first year show, and the local people sure know how to build. And they also got a lot of public attendees. (It wasn't quite as crowded as BrickCon, but maybe that's because it wasn't packed as tightly either.) One of the more interesting bits was that there were a bunch of tables of loose brick for the public to build stuff, including white bricks for Architecture, loose red and blue bricks, Friends bricks, Star Wars bricks, and even a bunch of Bionicle elements. And the public built some fairly cool things, especially in Architecture. I was impressed anyway. It was a fun event overall, and I thought it went over well for a first run in the Dallas area. I mean, their website was a little wonky, and they perhaps had a few more sessions than there was an audience for. (Except Danny went to all of them.) Still went out to eat at a few new places (to me) which seemed to include a lot of tacos. Oh, and on Sunday I threw my green spaceship, I'll be interested to see when those videos start popping online. Overall, a fun weekend. Pictures (and maybe a link to someone else's video) to come! Skull Scorpio doesn't have the most intriguing build, but he has some nice pieces, plus the infected mask of stone. So what if we drafted that set. Everybody keeps the mask(s?) but we split out the other pieces? (I mean, I think he has the most parts of the medium sized Skull Villians.) Thoughts? Also, I apparently generated more dicussion with my selection of the thumbnail pict than the rest of my review... so yay? I dunno if that is good or bad. 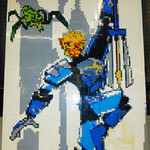 I’ve been involved with a lot of awesome Bionicle Collaborative Mosaic projects that’s wowed the public at various conventions. (Or so I’d like to hope.) So I’ve decided to compile a list of em, with their size, where they showed up, and who helped make them. (I’m seeing a lot of repeated names too.) I've included some images, where I can find them. 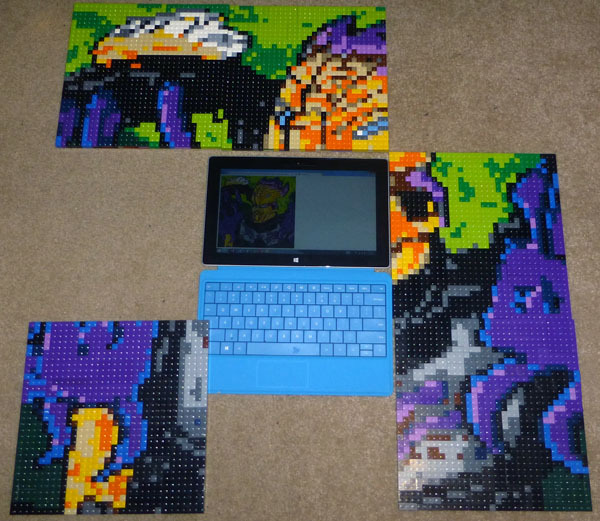 The first is the final design image that I got from the Mosaic Makers. (I still use Pic-to-Brick.) 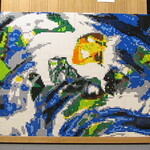 The second image is the finish mosaic at the convention. I’ll try to keep this post updated for future projects as well. 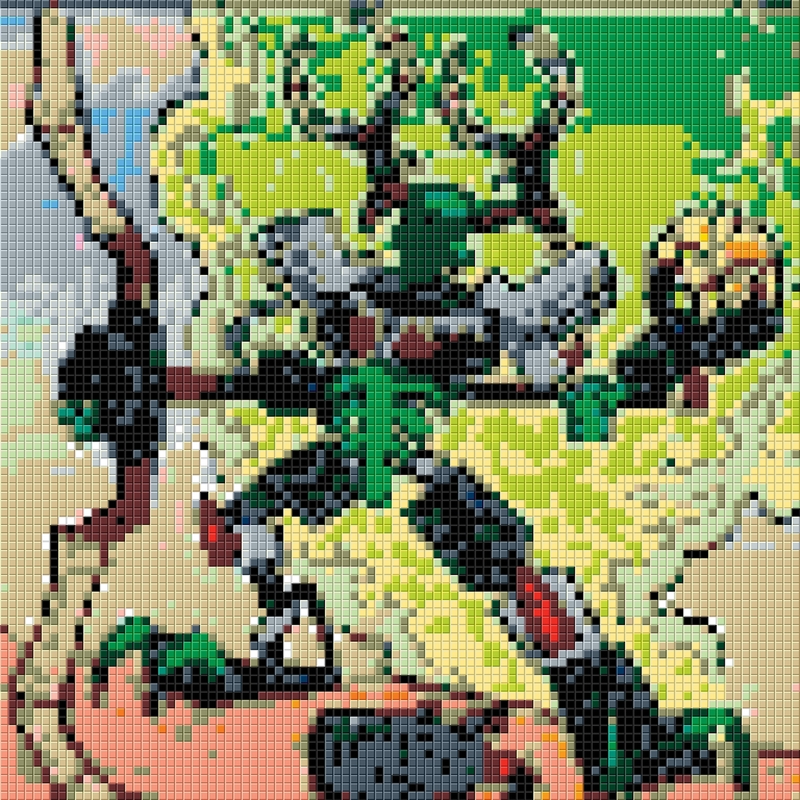 This is the first BZPower Bionicle Mosaic, organized by Chocolate Frogs and Nukaya. (Well, I did some of the initial design work.) 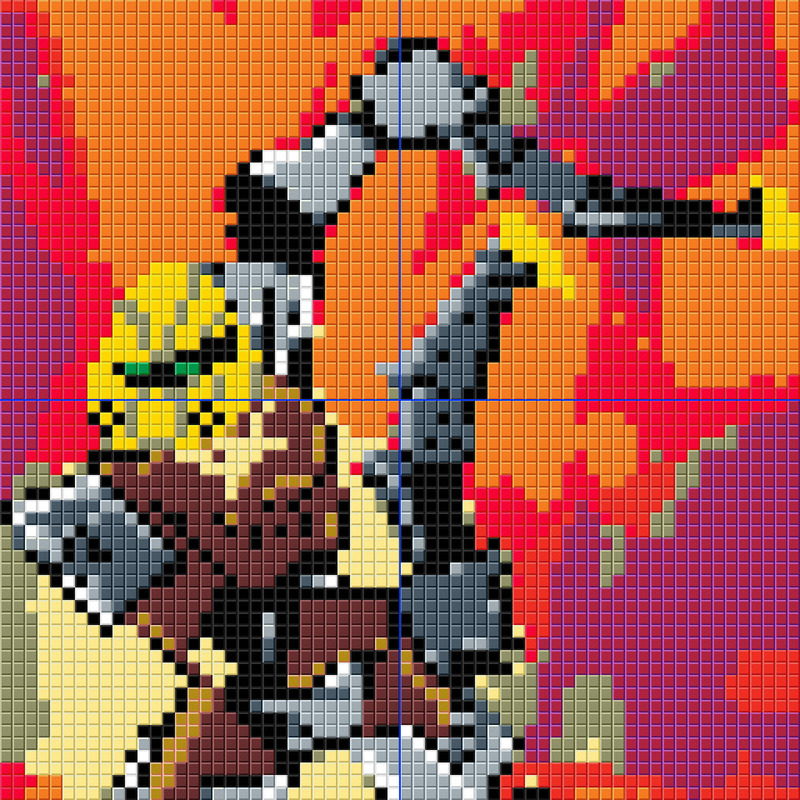 Kopaka was selected because of his neutral color scheme, which was easy to convert into a mosaic. 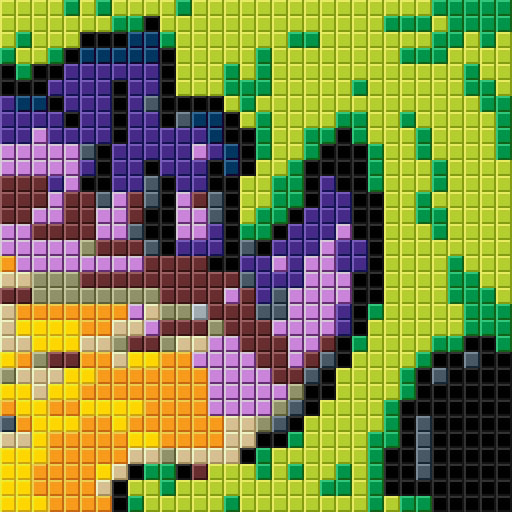 Arpy made the largest contribution to this one, with the 64x64 upper right corner all being his. 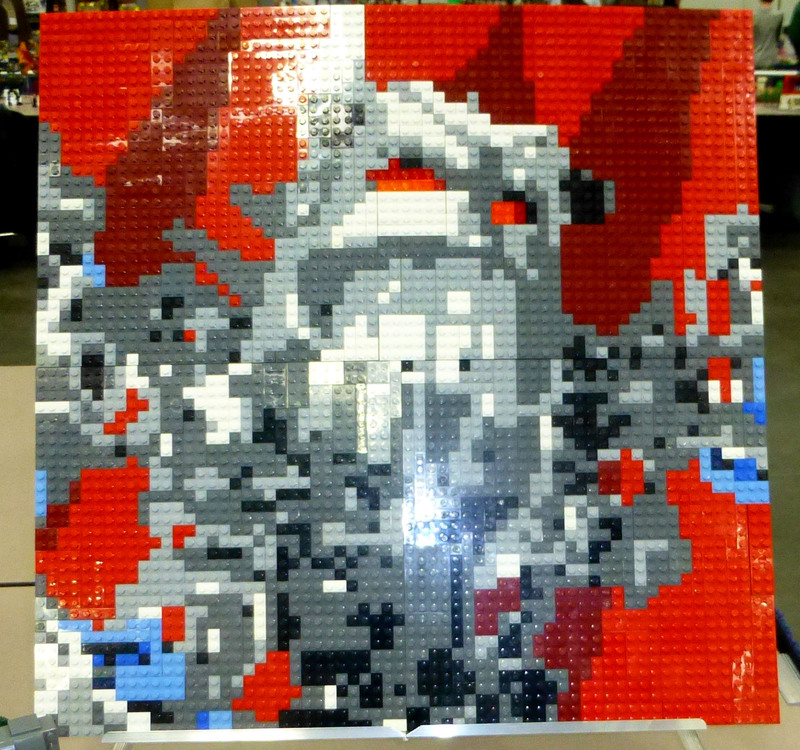 When the Kopaka mosaic got filled up, we pushed harder and came up with a second mosaic. Onua was selected because he also had a neutral color scheme with blacks and grays. This was again organized by Chocolate Frogs and Nukaya, and I provided the initial design. 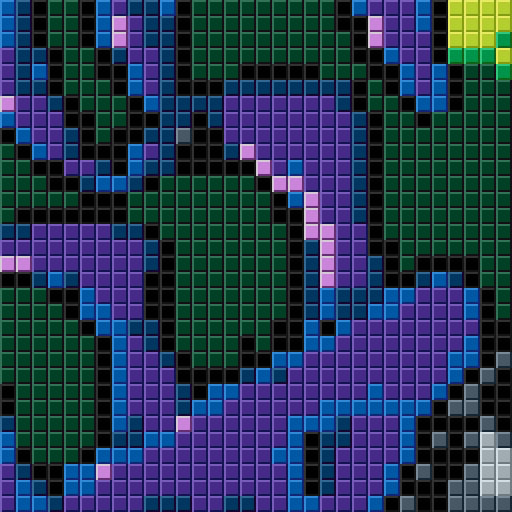 The following year, Chocolate Frogs and Nukaya went all out and organized a brilliant mosaic with all six Toa Mata. (This time, I did nearly all the design work.) 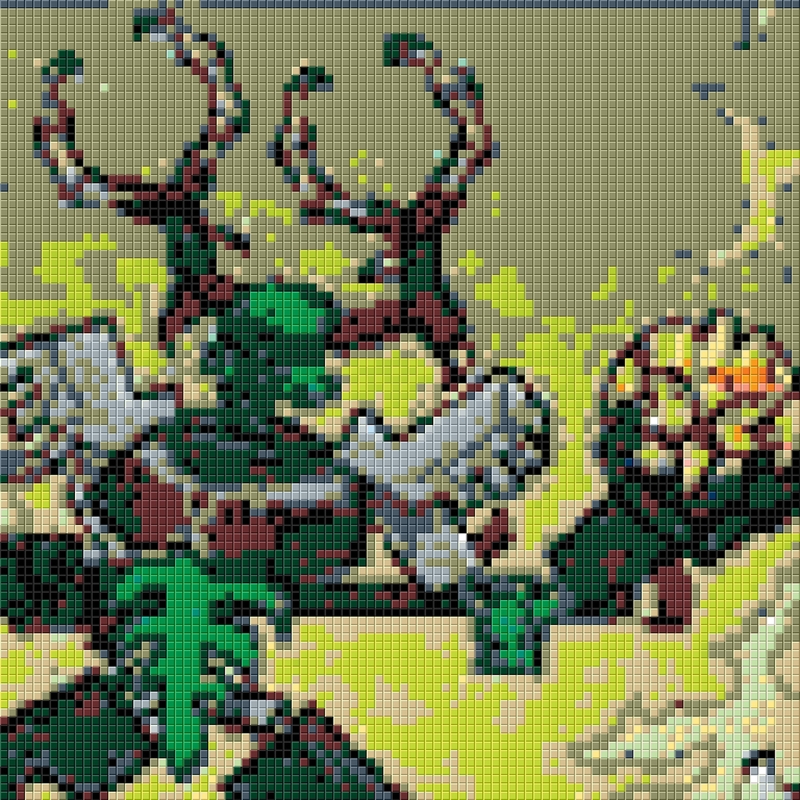 Even with all the awesome Bionicle creations that year, this mosaic was the highlight, IMO. Plus, this had most contributors so far! This year I helped put together a mosaic based off a classic scene from the MNOLG. 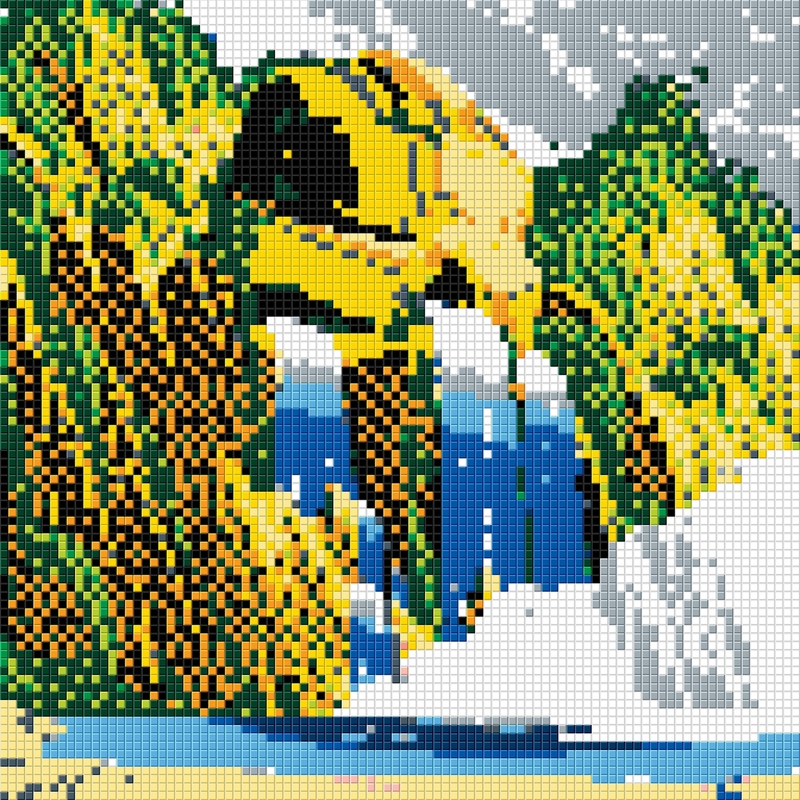 This one was a bit more challenging with the dithering pattern on the cliffs. 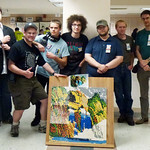 Although for some reason I never got a full shot of the mosaic on its own, but luckily we did take a group shot. 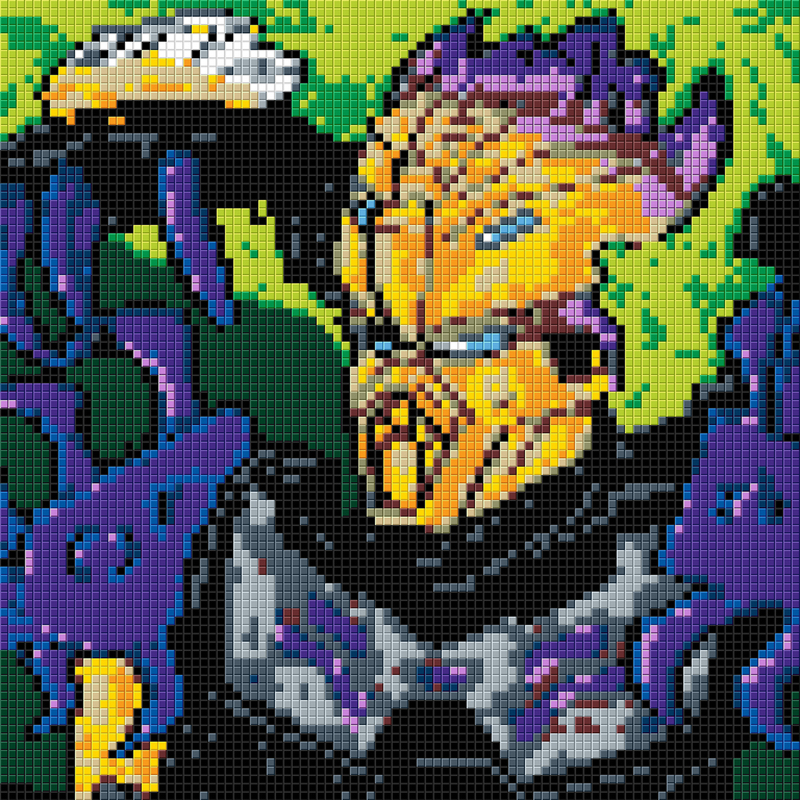 This year I designed a mosaic based off a classic Lewa promotional image from 2002. 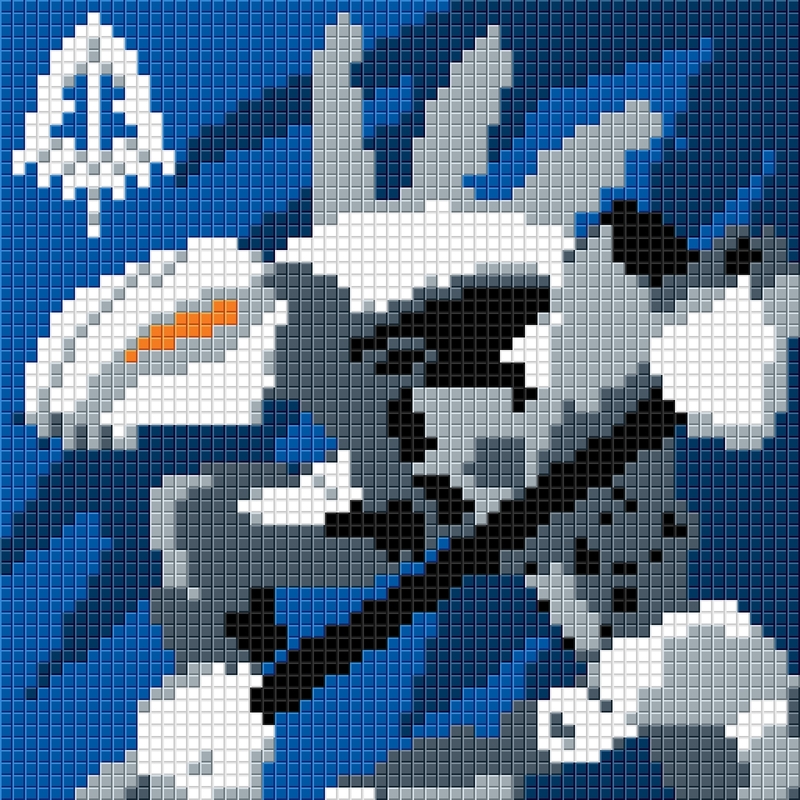 I put together a new mosaic to celebrate the reboot of Bionicle, featuring the new Gali design taken from the animations. This one was interesting because I tried to include the dark azure color, which is still fairly rare. 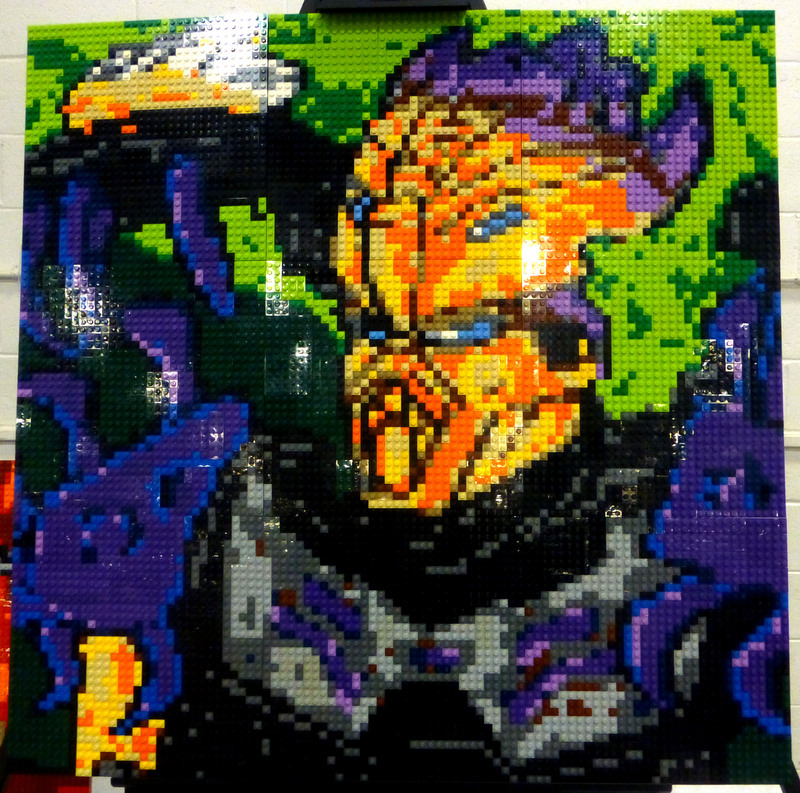 I did end up building nearly half of this mosaic myself, but it is also the first of our collaborative mosaics to show up at multiple conventions. This was a leftover design that got voted out against the above Gali design for the main mosaic of the year. But then Danny316 and I decided to throw this together at the last minute. 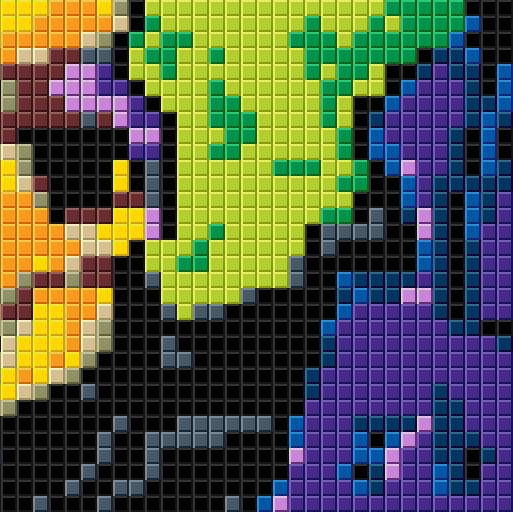 The biggest change here is the use of side brick design for the mask, as opposed to the studs-out view of the rest of the mosaic, which gave it extra detail at a smaller scale. This was easily the most daunting mosaic project I’ve been a part of. 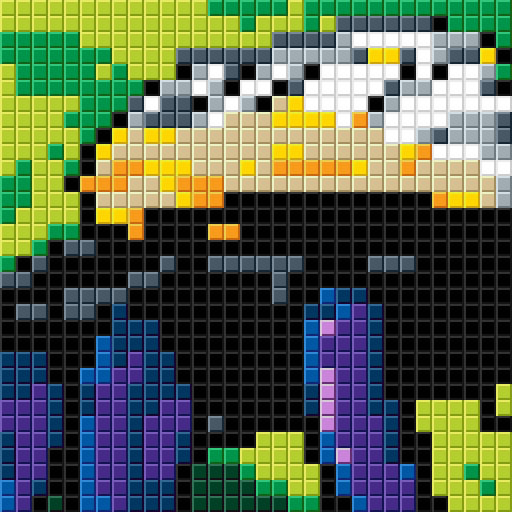 I had been contemplating the idea of making a Bionicle themed lenticular mosaic for a while. 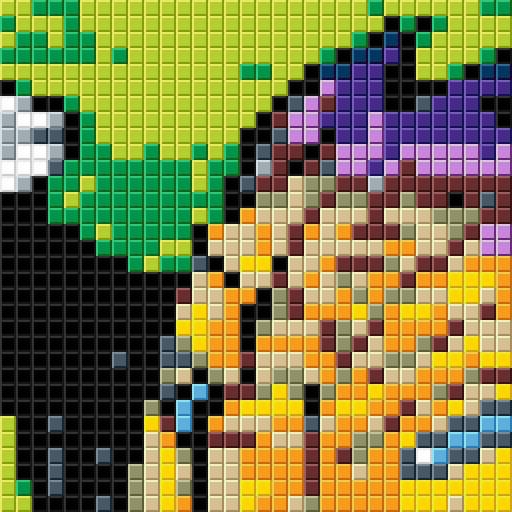 (These mosaics would have two designs that would change based on the angle they’re viewed from.) Because the number of cheese slopes required would be quite expensive, I never truly considered it, but then Black Six suggest utilizing LEGO’s RLUG Project Support Program to get all the elements we’d need. But the program had some requirements, so we had to think big for this! 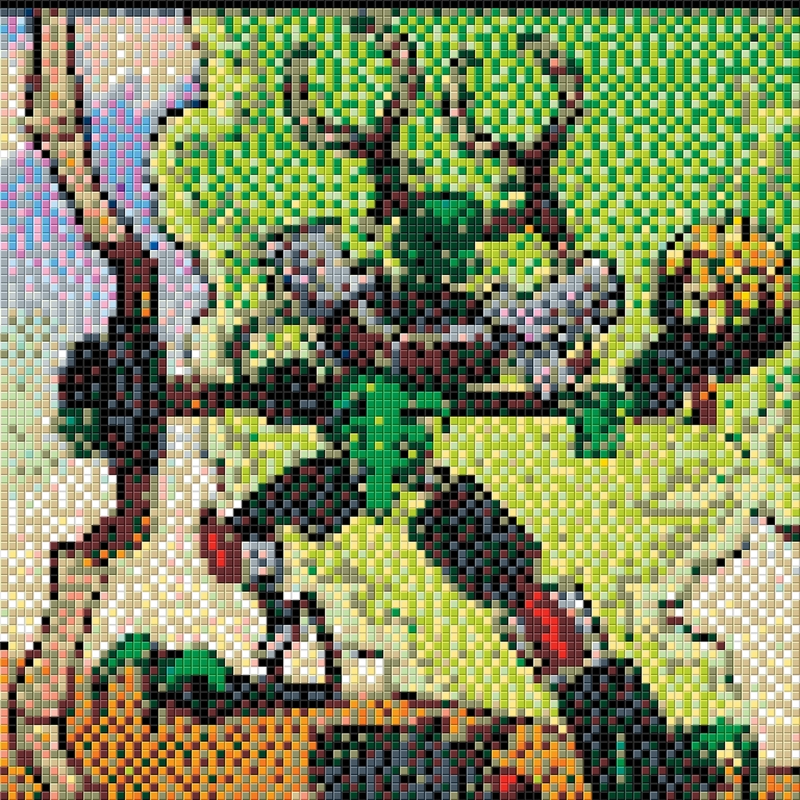 The basic idea was arrived at fairly easily; the lenticular mosaics would showcase the classic Toa in their 2001 Toa Mata forms and their 2015 Masters forms. We selected the four brightly colored Toa: Gali, Lewa, Pohatu, and Tahu. (Unfortunately, Kopaka and Onua didn’t make the cut with their blander color pallets.) 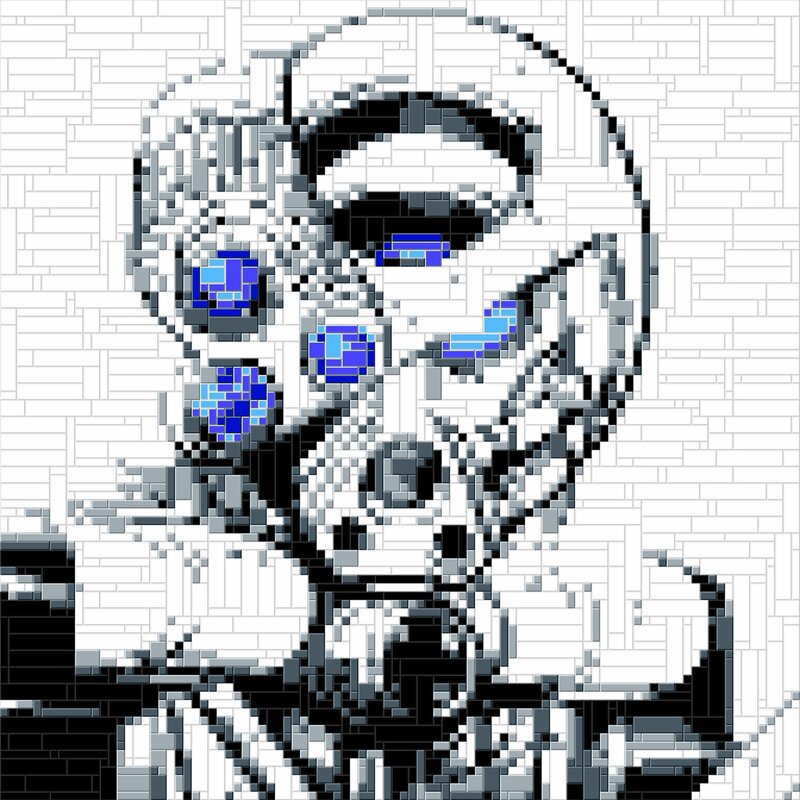 I designed 8 mosaics with contrasting backgrounds, with some input from other members. Even with RLUG Support, we still spent over $1000, but we bought nearly all the available colors of cheese slopes available at the time. 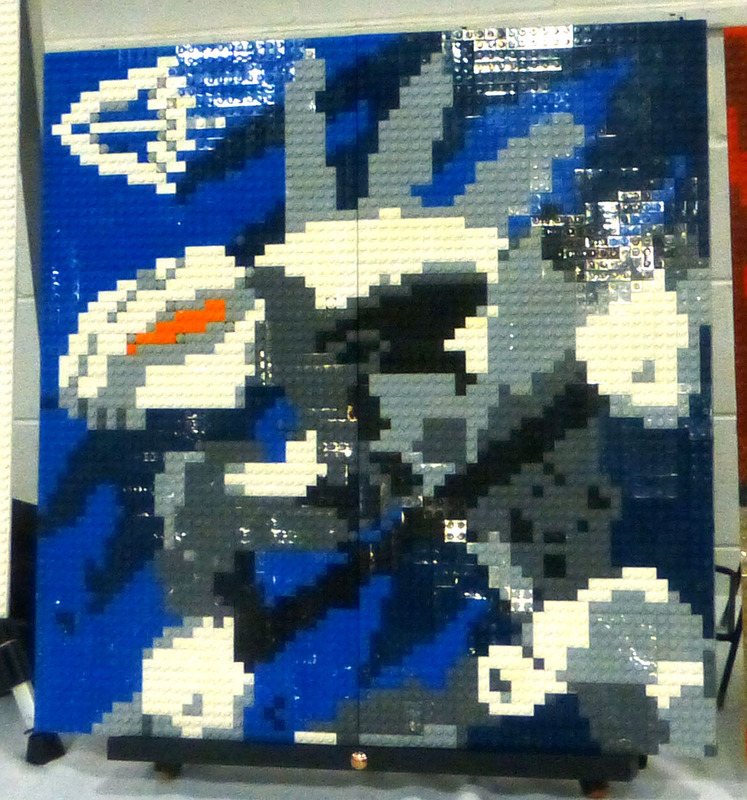 Black Six hosted some builds at his place, but we were still constructing these during BrickFair Virginia 2016! (I was lucky enough to attend that year and actually got to help build these, having spent months on the design process.) 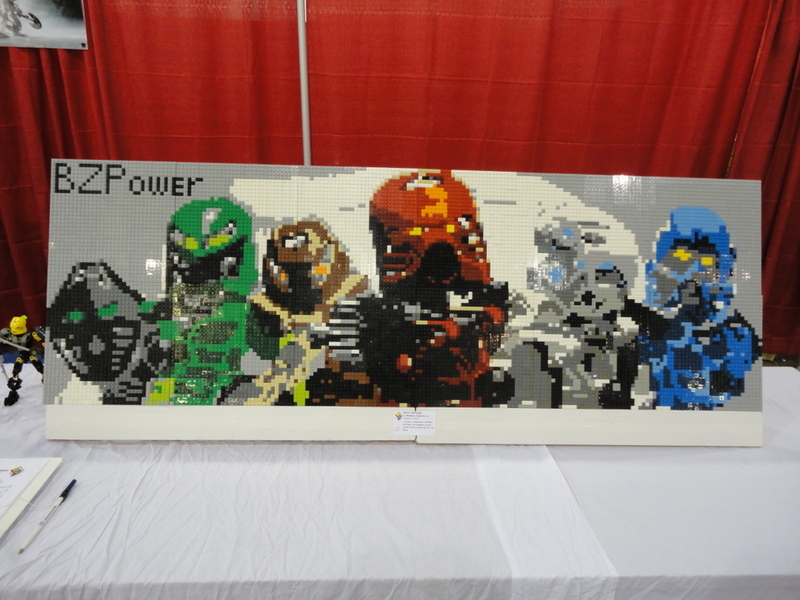 We got them completed just in time for the public event, and they’ve shown up to nearly every Lego Convention BZPower has been a part of ever since. There has been some discussion about dismantling them and making something new, but we’re not quite there yet! 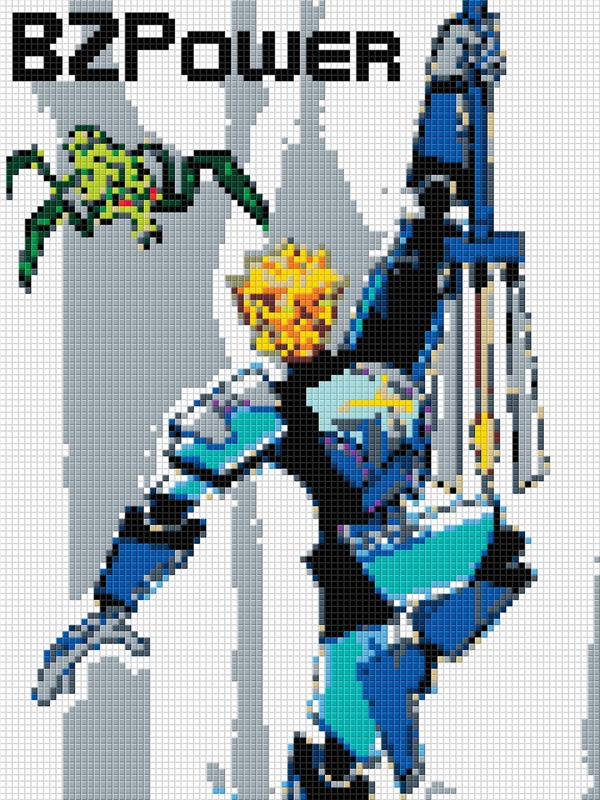 Overall, it was a probably the most ambitious project BioniLUG has done, but we rose to the occasion and got these ordered and pieced together! (And my design and parts inventory helped quite a bit too, if I do say so myself.) It was awesome to finally see these in person, and even more awesome watching the public’s reactions when they realized that the images were changing. Contributors: Too many people to count! 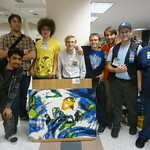 We had a good number of BioniLUG members who provided the funding required to pay for the pieces, and then we had multiple members building the sections both before and during BrickFair Virginia 2016. And Black Six has continued to display them at various Lego conventions ever since. 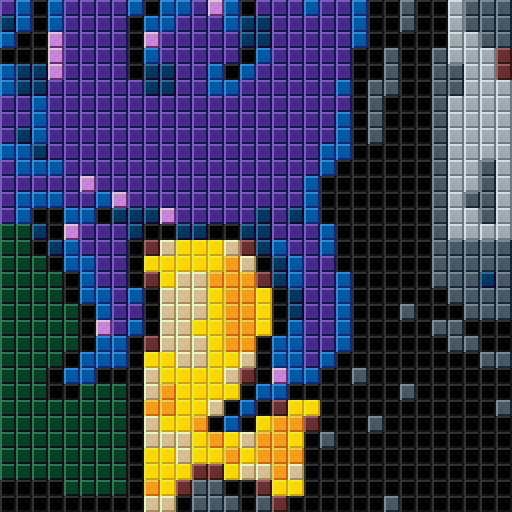 I wanted to complete a classic mosaic featuring the current (and ultimately final) line of Toa. We ended up selecting Onua, Uniter of Earth, with Terak, Creature of Earth, who had a significant purple presence. This has been the last big group mosaic we’ve put together. 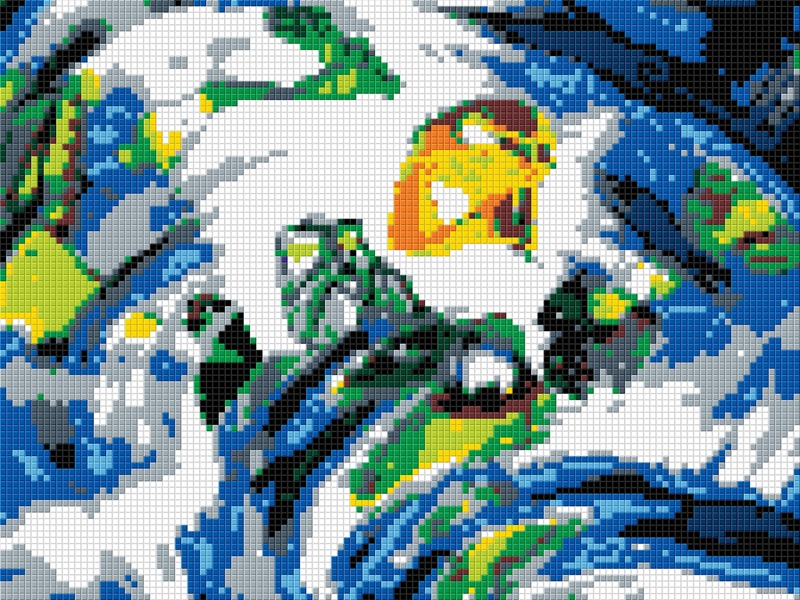 Chocolate Frogs and I decided to continue making smaller Bionicle mosaics, and CF wanted to focus on one of the Rahkshi. We eventually landed on this menacing design of Kurahk, the Rahkshi of Anger, with a contrasting blue background. After a year’s break, Chocolate Frogs and I tackled another classic white Bionicle character. 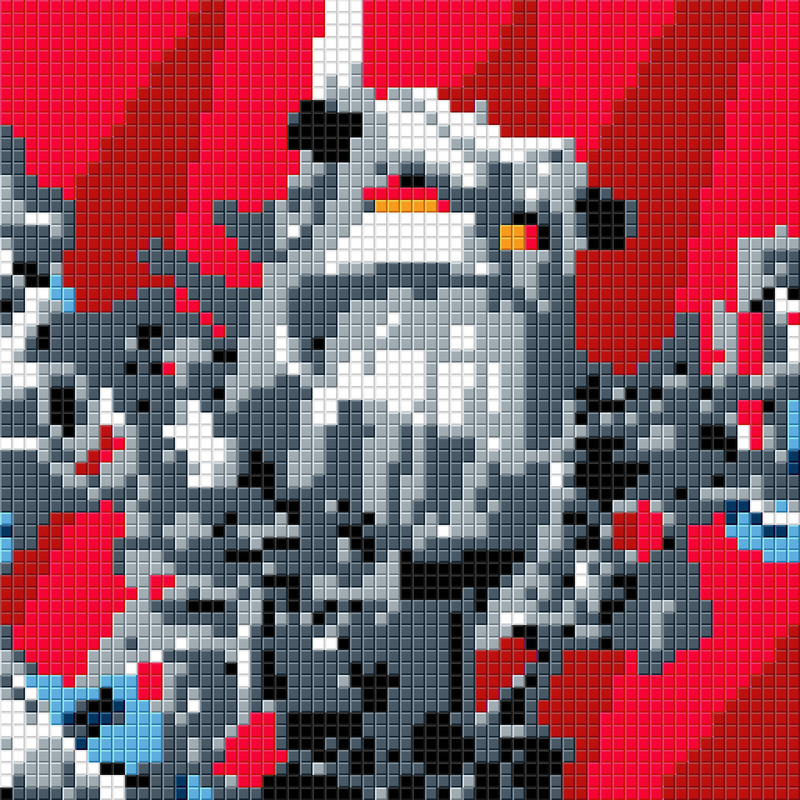 This time we chose an image of the Piraka, Thok, with a striking red background. *Names have changed since then, but this is what I had listed in my blog entries.